2,000 attend celebrations marking 40th anniversary of establishment of Shiloh in Binyamin, where the Tabernacle and the Holy Ark once stood. 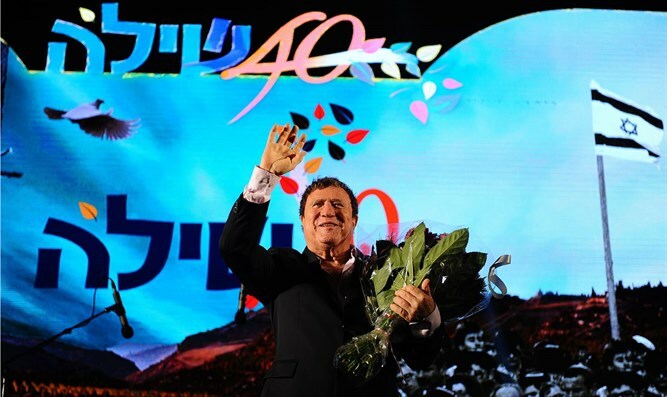 2,000 people took part Thursday in celebrations marking the 40th anniversary of the establishment of Shilo in Binyamin. The main event was attended by the presence of Agriculture Minister Uri Ariel (Jewish Home), the head of the Binyamin Regional Council, Avi Roeh, his deputy Israel Ganz, the founding members of the town of Shilo, and a number of the first Jews to in Judea and Samaria following the Six Day War. During the evening certificates of appreciation were awarded to the founders of Shilo, films about the history of the community were screened, and a performance by Israel Prize laureate Yehoram Gaon took place. Prime Minister Binyamin Netanyahu sent a special letter of congratulation to the residents. "When the founders of Shilo dug the first pebble in the land of the mountains of Ephraim, they added a new link to the chain of generations," Netanyahu wrote. Shilo is one of the places where our national roots - the city of the Tabernacle and the Ark of the Covenant - lie at the center of the spirit and unity of the nation. The descriptions of the Bible and the findings of archaeology shed light on Shilo's glory days, which are now renewed," added the prime minister.